It's one of those frequently asked questions on the forum. No matter what type of welding you plan to do, there's always an initial investment in money and time. Sure, some people might pick up new skills really fast. For others, it's trial and error, over and over again. Nothing comes easy to every person. Frustration is part of the learning process. There's no magical formula to learning how to weld. Some prefer to take courses, others prefer to learn as they go. What type of learner are you? Maybe buy some books or borrow them from a library. Maybe an in-person course is what you need. Maybe someone can give you some hands-on lessons. How you learn is really up to you. How much the equipment will cost is again up to you and the type of welding you will be doing. When Brad started welding, he took a diploma course at our local college and bought a cheap welder for under $200. To this day, he prefers stick welding and using minimal tools. That's his preference. Sure, you can spend alot of money on tools and equipment. But, if you're on a really limited budget, you can easily spend under $300 to get started. 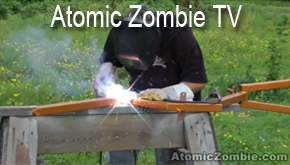 We have a step-by-step welding tutorial for beginners on the Atomic Zombie and ChopZone web sites. Take a few minutes to read through it, then shop around for the equipment and tools you will need. When in doubt, stop by our helpful community of bike builders for advice. We have a welding equipment tips and advice section with tons of information that will probably answer your questions. Now, these people in Townsville, Australia, know how to have a good time. Atomic Zombie bike building guru, Savarin, his wife and other bike freaks Bikes, lights, tinsel and loads of fun on recumbents, trikes and choppers. Too bad we have over a foot of snow in our region. 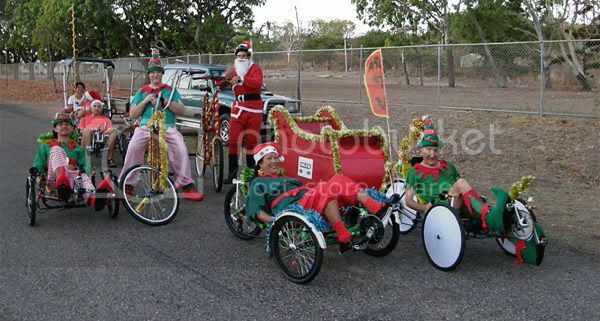 A Christmas parade on bikes would be so much fun. Cheers to all of you who dare to be different. Greetings and salutations from the Great White North where a winter storm is bearing down, just in time for Christmas celebrations, of course. Thanks to all Atomic Zombies for making 2009 a fun, successful year. Many new things will be coming up throughout 2010. "Hello from Scotland. I hope you and Brad have a wonderful Christmas. I really enjoy the forum and the camaraderie there. It's a nice place to hang out with friends from all kinds of backgrounds and talents. I am very impressed to see so many people helping each other. To all my bike building friends out there, the best of the season and always. Thanks, Jorge, and our very best to you and your family. This must have been a harrowing experience. I can't relate to the actual accident having never been in a plane crash, but I know how terrifying it is when you're in a speeding tube that makes such a hard landing on the runway that your teeth knock together, stuff flies out of the overhead bins, and the pilot has to literally slam on the brakes before running out of pavement. Those poor people. Thankfully, no one was killed, a testament to the on board and ground crew. 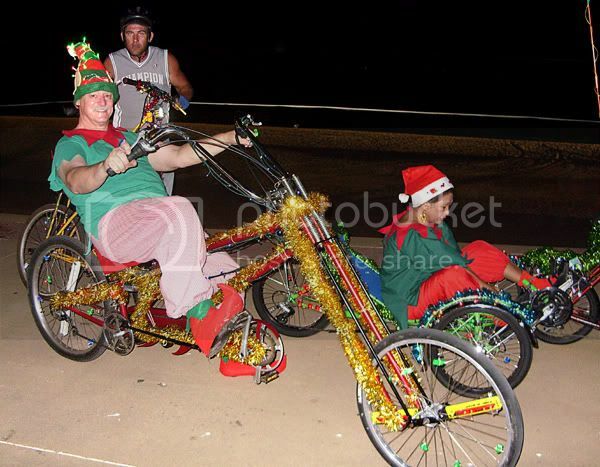 One of our long-time forum members, savarin, has finished his chopper and joined other bike freaks for a Christmas parade in their hometown. Check out his awesome new creation! Excellent work, buddy. 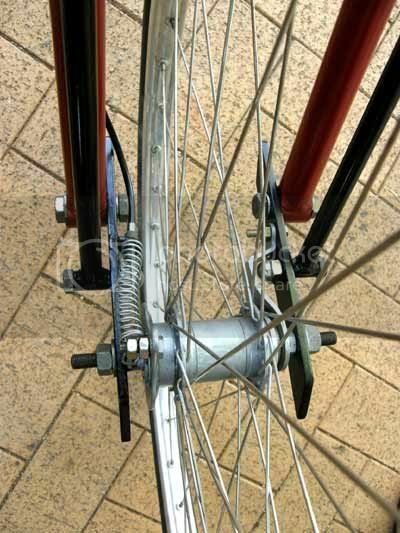 The bottom bearing on the rear 1" fork leg is a short length of saddle post with a nut welded inside at each end, the bit welded to the bottom of the leg is a short length of the tube the saddle tube slides in. One side bolted to the rocker, the other has a large washer of the same diameter as the outer tube bolted on to prevent the leg from sliding off the bearing. A bit of brass shim to take up the play. 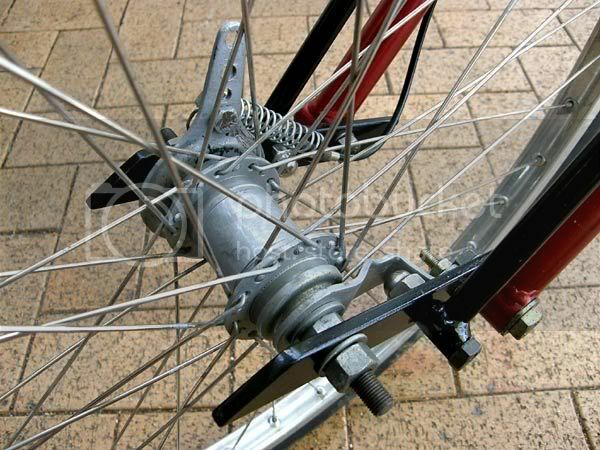 The bottom of the suspension tube has a short length of the same diameter tube welded to it, filed to get the clearance of the un-threaded part of the bolt. This bolt of almost the correct diameter screwed into the rocker arm and again the slack taken up with brass shimming. You can easily see how short the actuating arm really is and how I had to bend the reaction arm to give clearance for the inside nut holding the suspension bearing on. "Hi to all my fellow Atomic Zombies! I'm Tom and I live in Norway. 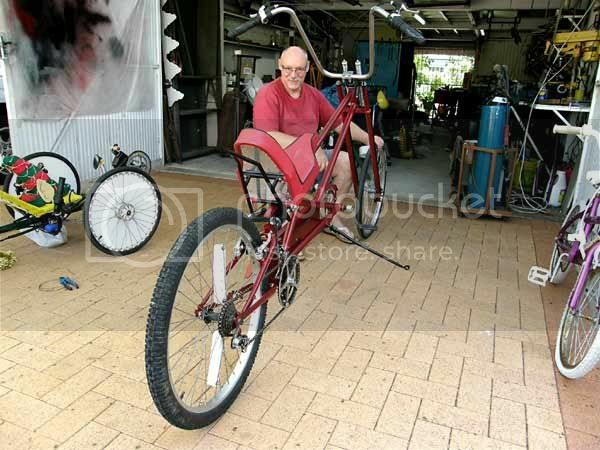 I build many bikes in my 30 years here like tall bikes and recumbents. 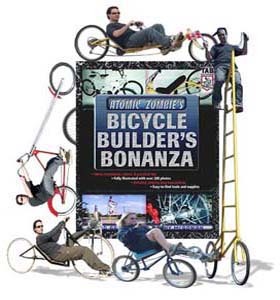 I like the Atomic Zombie forum where I have made many friends who also build bikes. It is a great place to meet and learn from each other. Thank you to Brad and Kat for all their hard work and to my friends around the world. I wish you all peace and happiness always. Your friend in Norway, Tom"
Thank you, Tom, for your nice email. We are glad you are part of our bike building family, and send our best wishes to you and your family, too. Greetings fellow Atomic Zombie krew and bike hackers! We are pleased to announce a brand new look for Atomiczombie.com . The site has a completely new look with fully integrated store which means fewer clicks, faster checkout and discounts for multiple download orders. We hope you like the new look. Season's Greetings, everybody. There are more additions to the Atomic Zombie family. There are now more than 700 entries in the gallery. Keep up the great work, everybody! ** T-shirts, Sigg water bottles, stickers, hats and more! ** Mouse pads, t-shirts, mugs, water bottles, bumper stickers, decals, BBQ aprons, and more. http://www.cafepress.ca/atomic_zombie . It all started with a post in the forum about a possible fraudster selling one of our plans, and using our pictures. Within hours of the original post, the bike building community converged on the seller and the service provider. I have no idea how many emails were sent by our bike building community telling both parties to stop the illegal activity. I personally fielded dozens of messages from concerned members, some of whom are lawyers and law enforcement, offering to volunteer their time to pursue the matter in the country of the offender. This all happened in a couple of days of the ruse being exposed to the community. WOW! Talk about taking action. It reminded me of a similar incident when someone set up a web site and took photos from various builders galleries and blogs, and posted them on his site as his own. 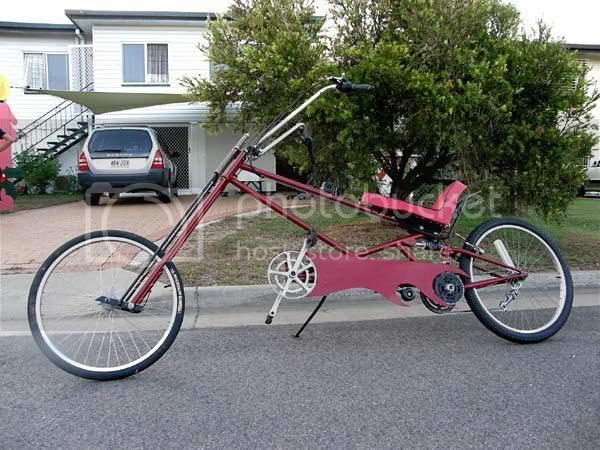 His intention was to design and sell custom bikes, but tried to pass off the pictures he took from others as his own creations. His deception was exposed very quickly. In both cases, the offenders were flooded with emails from the community demanding that they take the unauthorized content off of their sites. It took less than two weeks for each offender to comply. You can try to hide behind pseudonyms, but eventually, somebody will find you. The Internet has many dark sides, but it's amazing how people will suddenly come together demanding action and responsibility by those who disrespect our online community and the things we share in common, the things that bring us together. We can be a very protective group when we feel threatened and disrespected. We truly are an international community. Based on our monthly web traffic stats, tens of thousands of Atomic Zombie builders are all over the world. There is a fine line between sharing information to benefit the online community as a whole, and blatantly stealing others' work, trying to pass it off as one's own. The best practice is to give credit where credit is due, and don't assume that it's OK to rip off other people's stuff. Some people don't understand "netiquette" and misunderstandings do happen. Not everyone is malicious in their intent. However, it's best to err on the side of caution. Don't assume - ask first. It was incredible to see the bike building community come together many times this year to help each other, get involved in various causes and thwart illegal activities. We truly are a family that sticks together and stands together. The feds have nothing better to do with their time. 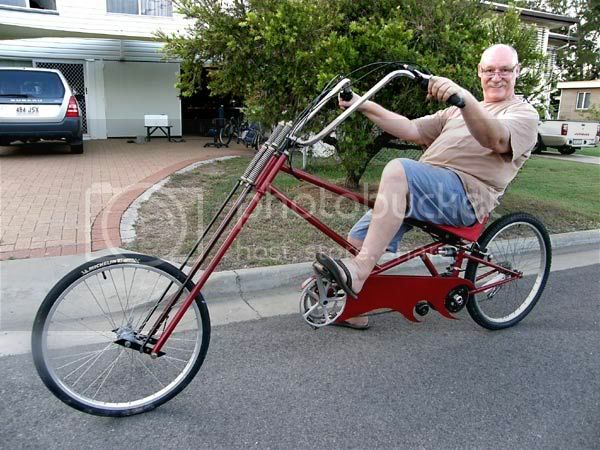 There are new additions to the Atomic Zombie family this month - choppers, recumbents, crazy bike and tall bike. Check out these and other awesome Atomic Zombie Krew members' creations at www.atomiczombie.com . 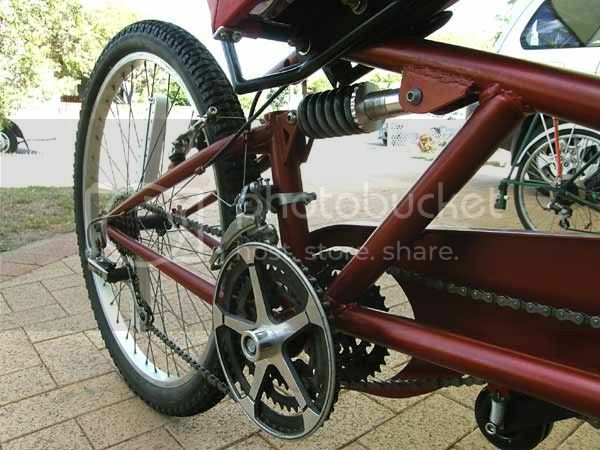 Keep sending in pictures of your completed human powered and electric bike projects.